As a public utility firm, CKWD is committed to promote the well-being of the people of City of Koronadal through effective and efficient delivery of potable and sustainable water supply, better quality and responsive services, utilization of modern technology, enhancement of its human resource capability and the transformation of the District into one of the most progressive and viable water districts in the Province of South Cotabato. A progressive, self- sustaining provider of sufficient potable water supply and quality service in the City of Koronadal. 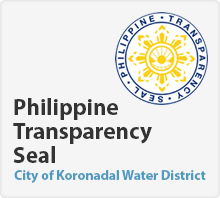 The City of Koronadal Water District takes pride in being a part of the public utility sector committed to deliver efficient service with the highest standards of integrity and morality. We care for the people in our community and we directly involve and engage ourselves in social, economic, cultural and spiritual activities that will uplift and improve their lives and their living condition. We recognize the value of collective energy and enthusiasm of all our employees and believe that each has a contribution to make to realize our vision. Thus, we strive to create a work environment where our employees can flourish and develop their highest potentials. We protect and care for the environment in which we live and from which we draw life, and endeavor for a word that is valued, restored, protected, and cherished by this generation and by the coming generation. We, the officials and employees of the CITY OF KORONADAL WATER DISTRICT, pledge to deliver efficient and equitable public service to all our concessionaires. Attend to our concessionaires’ concerns and complaints politely, courteously and without delay. We work according to the eight-hour standard working time, or beyond when the need arises. Be presentable at all times by wearing proper office uniform and identification. Provide feedback system to assess the quality of the services rendered and make necessary improvements. Provide comfortable area for front line Services. performs such other functions and operations incidental to water resource development, utilization and disposal within the city and its environment as are necessary or incidental to said purpose.